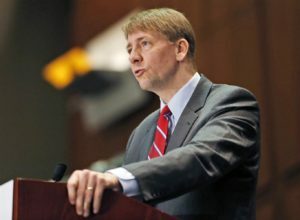 HomeArticles | NewsInterviewsIt’s Not Who Will Head The CFPB, It’s What Is The Future Of The CFPB? The fight over control of the CFPB will likely get nasty before it is over, currently it’s just another tweet for President Trump. The real question is the new direction of the agency not who is in charge. Whether its the current Deputy that is put in power or Trumps appointee, Mick Mulvaney it’s the future of the agency that we should all be concerned with. President Trump has stated recently “Financial Institutions have been devastated and unable to properly serve the public. We will bring it back to life!” which makes clear his desire for the agency is to re vamp or delete the agency. So what happens to the Debt Collection Industry if the agency is dismantled? What if it is just neutered? Lets explore these possibilities. What if Mulvaney takes over ? He will first of all have to evaluate the landscape as most of the staff are Elizabeth Warren diehards. Mulvaney has also called the CFPB “one of the most offensive concepts I think, in a representative government,” and claimed, “We have created … the very worst kind of government entity.” So he has not made any fans over there on day 1. Mulvaney will have to bring his own Lieutenants if he is to get any cooperation for change. I am not sure that change can be enacted without a complete rollover of staff in the CFPB. Either way it cannot happen quickly organically it will take a flush of staff to make anything happen quickly and I am not sure this can happen in less than a couple of years. In my opinion there will be no change in the agency till 2021 in this scenario. What if Leandra English Takes Over? Richard Cordray snubbed Trump by instating Leandro English to the open position vacated by himself starting the current drama. Likely there ill be a fight from President Trump and the Republicans to reduce the power of the agency but that will be quite a fight as the agency is just “too powerful” the exact problem that Republicans have with the agency. If English is to take over she will have the power and the staff to take her former bosses ideas to fruition. With a room full of high paid Warren supporters she will have the staff, money and power to move forward in the same direction as Cordray. What if The CFPB is dismantled? So whats likely to happen? This is well said, the fact that “some consumers” are getting away with debt is costing “all the consumers” and this is what the CFPB has been missing since it’s inception. Only time will tell what happens but Trump and Mulvaney have an agenda that will be hard to complete quickly due to the strength of the CFPB. The ARM industry needs a break and so do the consumers my hope is we both get what we want for the holidays.